Chances are you have taken this blog’s featured product for granted. We won’t hold it against you. At the time you were likely hurt, or sick, or perhaps you are one of those angelic people who work in a hospital, and were taking care of people who were hurt and sick. Either way, you most likely didn’t look up and notice what was holding up your privacy curtain. In an environment teeming with humanity at its most vulnerable, you were probably thankful for something to hide behind, even something as relatively insubstantial as a curtain panel. In this blog, we would like to highlight the hospital curtain track that helped give you some private space when you needed it most. We discussed the technical features of our 88001 Privacy Curtain Track in a previous blog. We won’t go on about them at length here except to say this: Our hospital curtain tracks are of the highest quality, and are the industry standard based on their durability, unique configuration (available in straight lengths, and pre-bent 90 degree and 45 degree curves), appearance, and value. 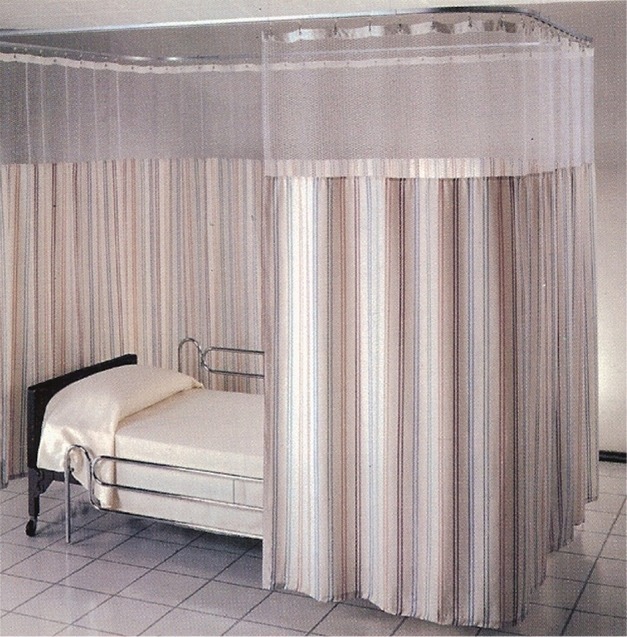 Paired with our Sundance Antimicrobial Privacy Curtains, which inhibit the growth of bacteria, they are simply the only choice for hospital or clinic use. That’s not to say, however, that hospitals or clinics are the only place these “hospital” curtain tracks can be used.Our Curtain-Tracks customers include medical offices, spas, gyms, dance studios, and retail stores. These tracks are useful anywhere privacy needs to be created, but you don’t have the luxury of a wall or door; and they can hang any curtain with grommets across the top. The track itself is discreet; it is ceiling mounted and keeps a low profile, and can even be recessed into the ceiling for a smooth floor-to-ceiling look. Do you need to create an oasis of privacy? Give us a call us at 888-434-7444 and we will help you get started with our Privacy Curtain Track.